8:14 min. - For the Innu, living by the rhythm of the seasons also means planning ahead. Summer is the time to organize the next departure for the hunting territory. After the great gatherings of early August, they go upriver to their traditional lands. Messenak accompanies the hunters but is haunted by the suicide of the friend who was to have accompanied him. Messenak - The Mani-utenam Festival of Aboriginal Music, Innu Nikamu, takes place at the beginning of August. It means "the Indian sings". 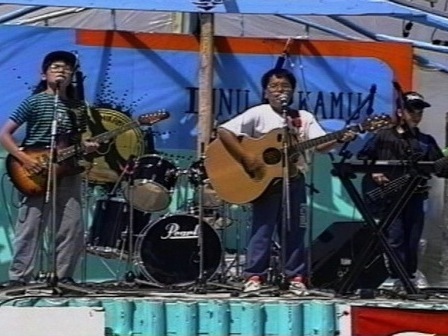 It was at Innu Nikamu that my parents met... so it's always special for me when I go there... as if I was returning to my birthplace... Last summer Kashtin gave a concert just for us, the children, at Innu Nikamu... It was really exciting for me because my aunt Kathia and my uncle Tuktu also came to sing... I was so proud of them. I also loved the show given by the Meshtashipu Band, a group of young people. My cousin Jean-François sang and played guitar with them. But a few weeks later Jean-François committed suicide and so this memory became a sad one... Even though school had started again, Mushum invited me to join in a special hunting trip near Schefferville, at the beginning of September. It was a 10 hour train ride from where we live. I thought of Jean-François during the trip... He too had been invited to come along... If he hadn't committed suicide, we would have been together... I looked at the landscape, the mountains and the ravine through the train window and I had the feeling that he was there, I felt his presence all around... When we got to our campsite I had the impression of being on another planet... there were hardly any trees... That's because it was the beginning of mushuat, the tundra, as Mushum told me... But I was surprised because there were big holes everywhere. Uldéric, an elder from Schefferville, later met up with us and explained to me that the holes were open pit mines, where men and machines had dug to extract iron... He said something striking... He talked about the wounds of "our mother the earth"... he said we could take from the earth, but that we had to give something back in return, and most importantly, that we had to repair the wounds we inflicted. I liked to listen to him speak of the earth as if it was a person... like someone he loved... We finally arrived at the campsite with Uldéric and his wife.. One of Mushum's brothers, who had left before us, had already killed a caribou. That meant that everyone would have food until the first hunt... With Évelyne we prepared uatnan, a medicine made from boiled larch bark. Hé Andy, tu viens du Saguenay ? À Malio' au mois d'Août je crois, il y a un festival de musique qui s'appel Innu Nikamu (L'innu qui chante) c'est un rassemblement que tu veux ? C'est là !